Etude House's Snowy Dessert Holiday 2015 Collection certainly seems to be a hit this year. Between the food-themed items, the absolutely adorable packaging, the attractive products, and the affordable prices, I think Etude House has basically ticked all the boxes for a winning Christmas collection! 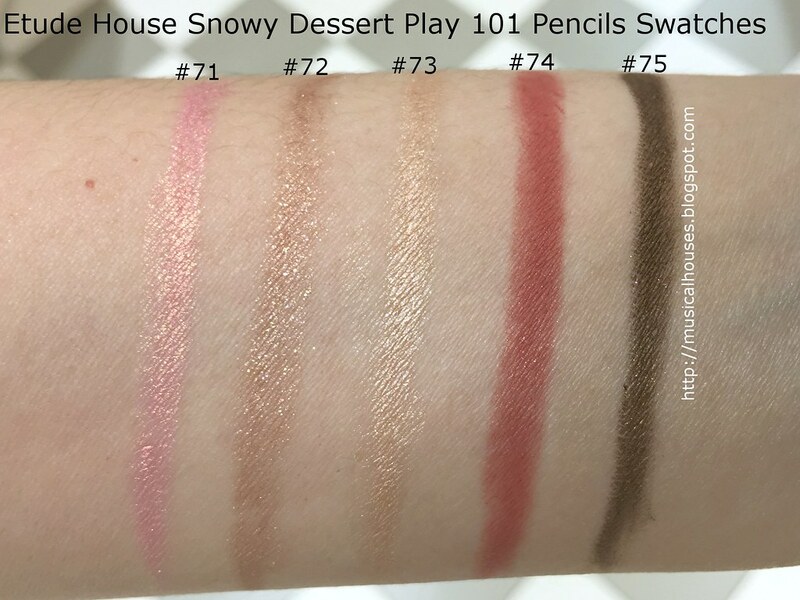 I've taken some swatches of the colour makeup, namely the Pudding Tint, the Ginger Cookie Blusher and Contour, and the new Play 101 Pencils, so without further ado, let's check out the swatches! First up, though, I have to apologize for the swatches. I had some items from the collection but not all, so I tried to get the full range of swatches by going into the store to swatch the shades I didn't have, but I think the lighting in the store was less than optimal. Still though, I think the swatches are good enough to give you ad indication of the colour! First up, the Snowy Dessert Pudding Tint. The Pudding Tint is actually a lipgloss, with a sort of solid gel-like texture that is reminiscent of pudding, hence the name. They come in little pots, and also come with a little spatula to scoop and apply it with. The scoops will come in really useful when you use the product - the texture is a bit more firm and solid than your typical lipgloss, almost kind of like jello, which is pretty cool. Using these definitely is a novel experience for sure. #1 Strawberry is a straight-up fire engine red, and pretty nicely pigmented too. #2 Apricot is a orangey coral that's actually quite a bright shade, and not apricot-like at all. #3 Grapefruit is a pinky-coral shade with warm undertones. This is quite bright too. #4 Lychee is a clear shade, that turns a pale shade of pink. It's mostly transparent, with just a hint of pink, and contrasts against all the other shades, which are definitely party-bright. #5 Apple is a warm coral-red shade with gold glitter, although somehow it doesn't show up in the swatch. It's also the only shade that comes in two phases - while the rest are a solid colour all the way through, this one has two layers, the first of which is clear, and the bottom layer which has the coral-red shade. Because it has two layers, it is more sheer than the other two. The next product is the Play 101 Pencils. These look a little like candy canes, with a striped pattern. They also come in some really wearable colours for this season, which is great. Some of the finishes of these are frosty and metallic, as you might expect with Christmas collections, but some are creamy and gorgeous. #71 is a metallic light pastel pink, great as an eyeliner or eyeshadow. This also has great staying power. #72 is a metallic light warm brown, with the same finish as #71 but in a different shade. This would be a great eyeshadow and eyeliner shade, for sure. It's also not too warm, although it does have a hint or bronze. #73 is a metallic vanilla, similar to #71 but yellow instead of pink. Again, a great eyeliner/eyeshadow shade with great staying power. This can also be used on the inner corners of the eyes, too. #74 is a lovely medium-toned muted berry red, which has a creamy, shimmer-free finish. The creamy finish means that this is more of a lip/cheek pencil, with a nice non-drying finish on lips (for a pencil). 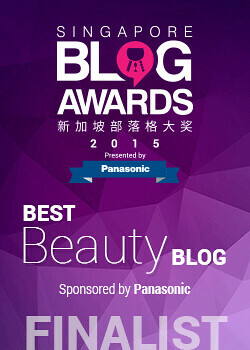 You could use it on eyes, but the staying power would not be as great as the shades that are geared towards eye use. #75 is a lovely deep brown with some gold shimmer. The gold shimmer here is fairly muted, and not discoball OTT. This is great as an eyeliner or eyeshadow. I personally love the Play 101 Pencils as eyeliners, so this is going to be in my stash for a long time! Lastly, we have the super-cute Gingerbread Cookie Blusher and Gingerbread Cookie Contour Maker. These are super collectible just based on the packaging alone, and fortunately, also house some quite pretty shades of blush and contour respectively. The Gingerbread Cookie Blusher holds two shades of peachy-orange blush, and the Gingerbread Cookie Contour Maker holds a shade of highlighter, and a shade of contour. All the shades are shimmery, but not glittery. They smell really amazing too! 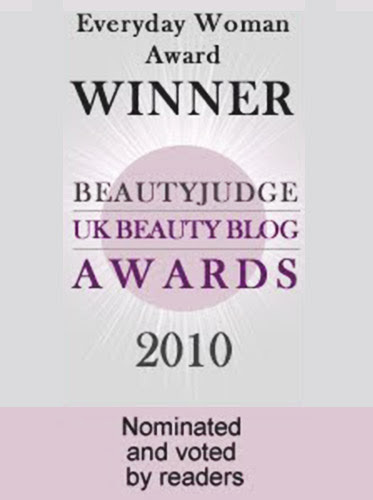 The Gingerbread Cookie Blusher has two very similar shades, both of which are shimmery orange-peach shades. One shade is lighter, and one is darker, but the shades are very much sisters. When blended together, you get a medium orange-peach shade. (Wow, I'm being very descriptive today, aren't I?) This is definitely a warm-toned blush duo, and on me it does pull quite orange, in a rather Oompa Loompa kind of way, unfortunately! 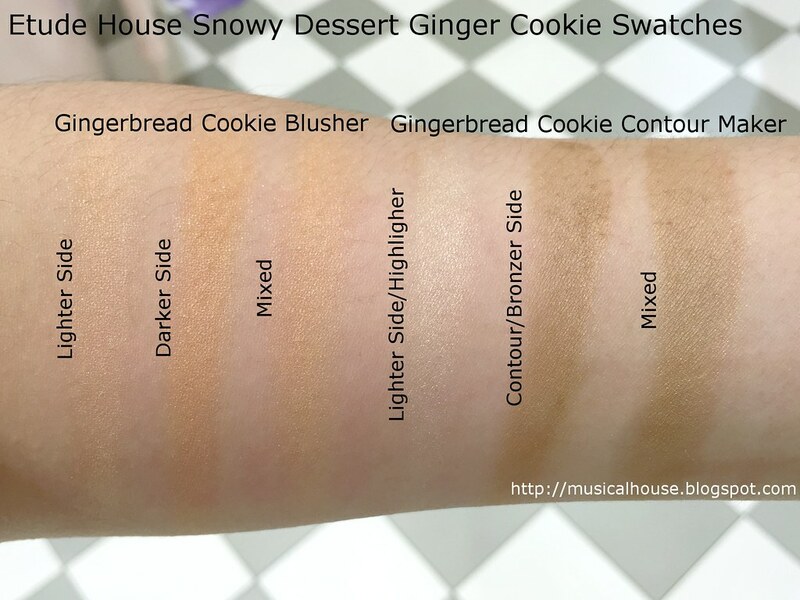 The Gingerbread Cookie Contour Maker is predominantly geared towards women of fair-medium skintones. I imagine that the bronzing/contour shade might be a bit too light for those who are darker-skinned. Both shades have shimmer, although the shimmer is fairly low-key, so if you prefer shimmer-less contour shades, then you might want to check this out in person before buying. I think this would be a great highlighter/bronzer combo for fairer skins, for whom it can be difficult to find bronzer shades. Lastly, we have the Snowy Dessert Scented Tablets (on the right, beside the cupcakes). 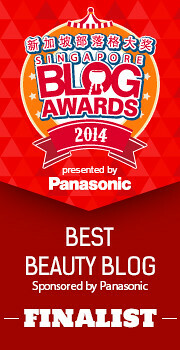 Although this isn't a makeup item or a beauty item per se, it's still pretty cool! These are basically triangular-shaped slices of wax and scented oils, with the scents reflecting the Christmas themes. The red scented tablet has the scent of red velvet cake, while the white scented tablet smells of tiramisu. Between the two, the white one has a stronger scent, but I have the Red Velvet Cake Scented Tablet hanging up in my bathroom, and it does a decent job of diffusing its scent within the room. Each Scented Tablet comes with a ribbon that you can use to hang up the tablet. 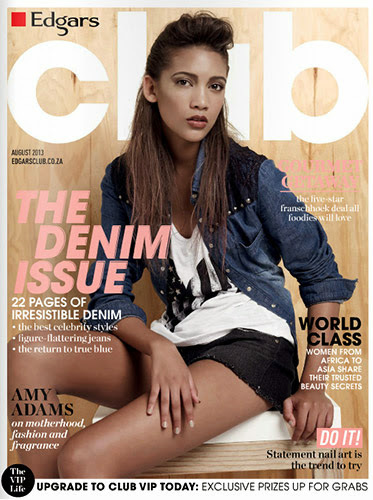 You can hang it up in cupboards, or just stash it in drawers and closets, and it will give the space a nice scent. Would I recommend this collection? I like it! I love the cute, adorable seasonal packaging, the lovely colour range (bright lips, with neutral eyes and cheeks), and the quality of the products is also quite good too. Of course these are all limited edition, so don't wait too long to get them. These definitely live up to the Etude House name in every way - cute packaging with a girly sense of fun, combined with novel products of good quality - and I do think this is one of the cutest Christmas collections around. The Bottom Line: The Etude House Snowy Dessert collection consists of a mix of familiar and new products, with cute seasonal packaging and good quality. wow, great and informative review! i only have the Grapefruit pudding tint and i love it! although i tend to use it more often as a blush instead of using it on my lips. 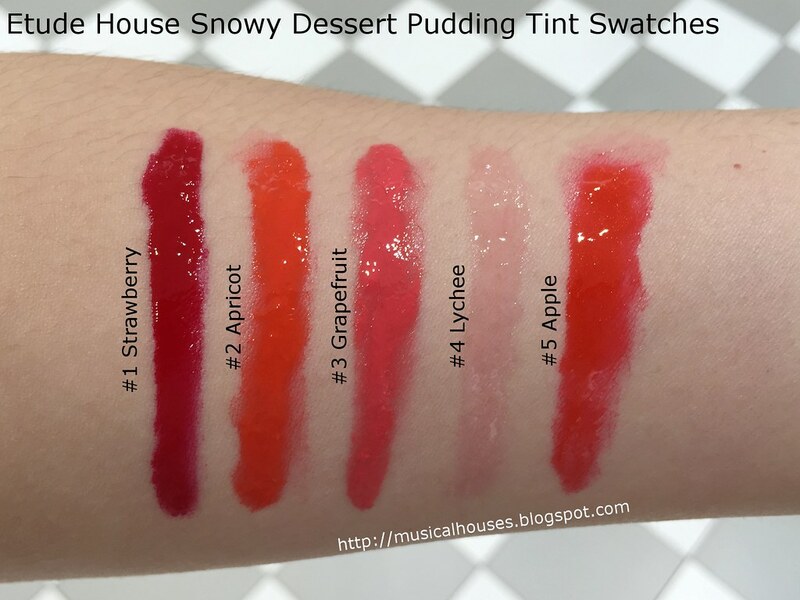 Does the snowy dessert pudding tint can be use as a blush? Thank you. @Rica Teaño: Yes, you can use it as a blush - I've known of people who use it this way! But it might be wetter and stickier than a typical cream blush. Hope this helps! I really like this collection. Did you buy the sets etude house offers or did you bought them seperately?